The conversion included site office, security, canteen and drying room facilities. 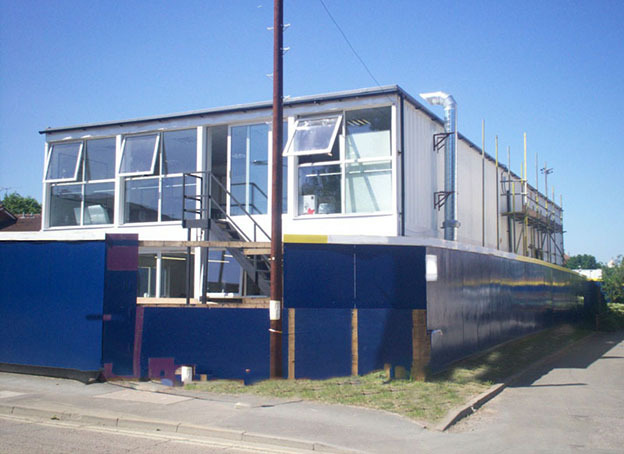 This container site office conversion is a fully moveable and reusable structure. As a visitor to this container site office it’s hard to believe you’re actually inside converted cargo containers, it looks and feels like any traditional office space. It all started when we were approached by a construction company who wanted to explore the possibility of using second hand freight containers as the basis for a site office, with welfare facility. Their goal was to reduce costs compared to other more traditional portable building options. How the container site office was built. The design involved the removal of the entire side walls on some units to allow wide open spaces within the site office. Ten used 40ft high cube containers were moved into the workshop and conversion work began, including the installation of window openings and high security steel personnel doors. Next the main cargo doors were removed and panelled in where required, or left off where not. Then, painting the outside perimeter walls followed which had the advantage of smartening the containers up. Office, security, canteen and drying room fit out. Finally the ten containers were then delivered to site and lifted into position for the customer to complete full fit out into office, security, canteen and drying room facilities. The high standard of the building astonished many of the company’s employees, who had not been familiar with the potential offered by shipping container conversion until now. And because the site office conversion was built within budget they decided to place repeat orders of these customised complexes for other locations. Update: The container site office complex shown was dismantled and recycled for use on yet another project, which highlights that this is a truly sustainable building concept.